Springtime is a beautiful time of year in the vineyards. Though we haven’t received nearly the amount of rain yet this year that we would have hoped for, there are still important things taking place in the vineyards that merit noting. 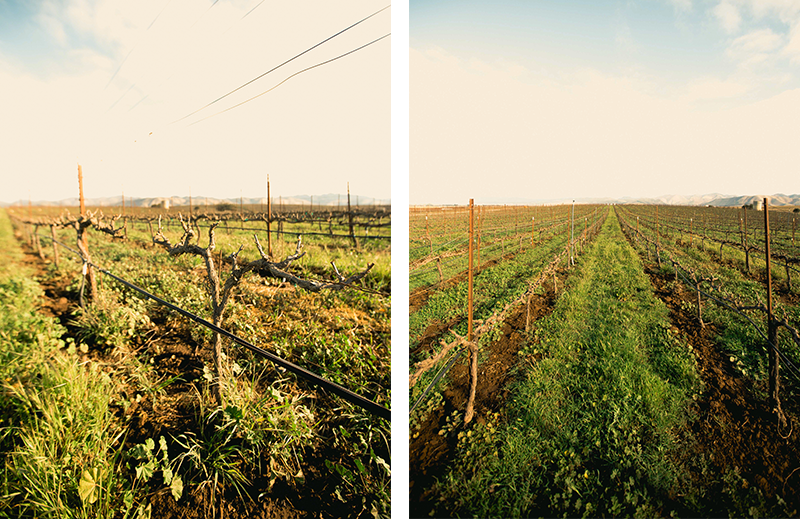 We pruned our vines in mid-February, just before these photos were taken. 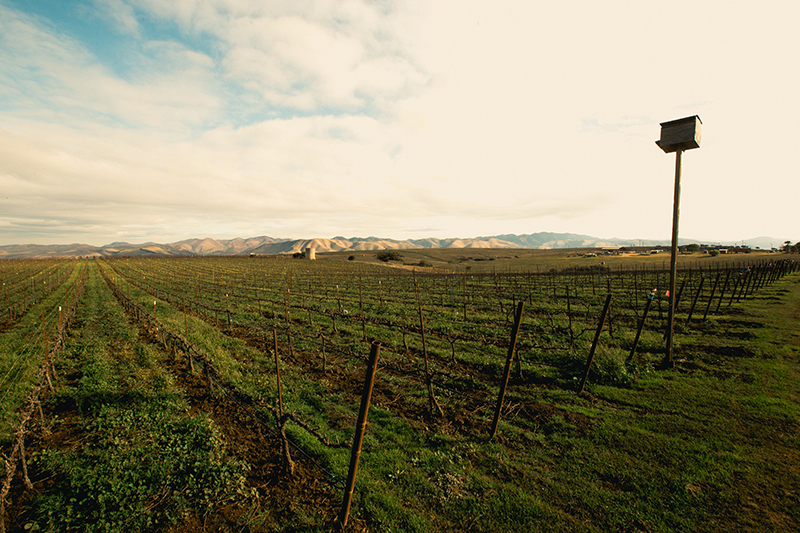 Warmer temperatures this year have forced early bud break, which can be challenging when cold nights and frost are still prevalent, though we are hopeful for a wet March to mitigate these challenges and give our vines the moisture they crave. 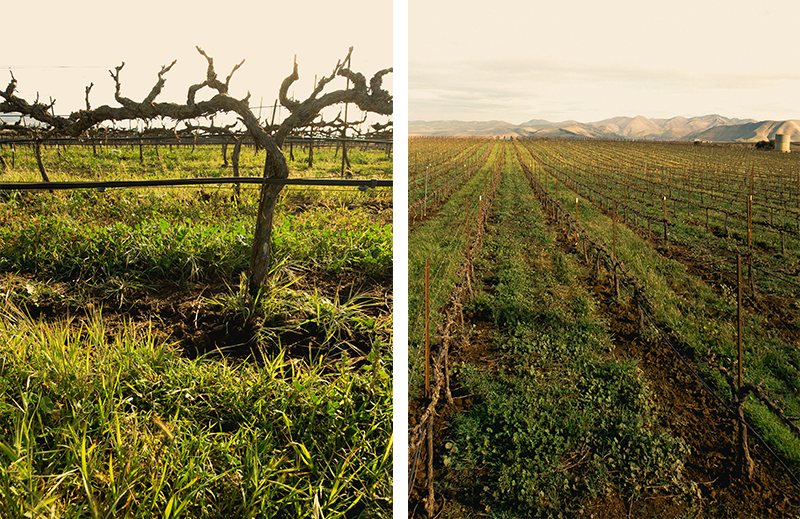 As a means of organic farming, we plant a cover crop between the vines each Fall. Our property has a long history of oil drilling and planting a cover crop does many things: a major element is that of erosion control. It also improves the soil and reduces weeds without the use of chemicals. When Spring rolls around, it’s time to till the cover crop into the soil. Most cover crop species benefit from spring time mowing, as it can eliminate shading from faster growing weed species, and promote tillering, or expansion of the plants’ crowns. Our cover crop is tilled into the earth in-row with our Clemens weed blade to remove the weed species that come up between the vines. For some of you this may be old news, but for those of you who are new to the industry, here are some important details on cover crops and what makes them so important to the vineyard. Keep your eyes peeled as you drive through vineyards, orchards, and other agricultural areas as cover crops aren’t just particular to vineyards. The foliage of cover crops reduces the velocity of raindrops before they hit the soil surface, preventing soil from splashing. This prevents slaking of soil aggregates and sealing of the soil surface. (When this occurs, runoff increases, along with soil erosion). The roots of the cover crops bind soil particles together, improving soil structure and water penetration, while preventing the soil particles from moving. REGULATE VINE GROWTH: Cover crops can be used to both invigorate vines (augmenting soil nitrogen from nitrogen-fixing legumes) and devigorate vines (root competition from non-legumes with the vines for nutrients and water). IMPROVE SOIL FERTILITY: Besides increasing soil nitrogen, decomposed cover crops increase the soil cation exchange capacity. Therefore, the ability of a soil to hold and exchange nutrients increases. Additionally, nutrients are often chelated into organic complexes, and are more readily exchanged from these substrates than from inorganic clay minerals. 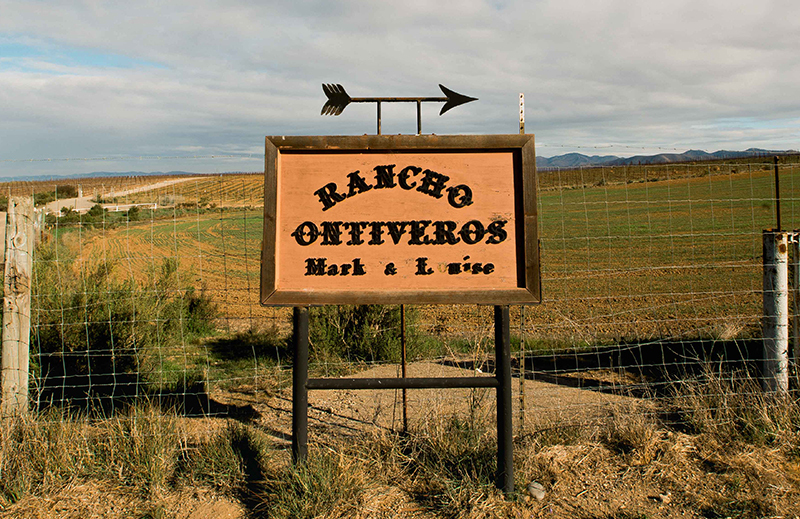 Since many organic growers also apply compost, this also adds to the fertility of vineyard soils. ENHANCE BIOLOGICAL DIVERSITY IN THE ROOT ZONE: Organic matter is a food source for many organisms. Many of these organisms assist in recycling cover crops into the soil, while improving soil physical qualities in the process. Particularly noteworthy are increases in earthworm populations; they are a good indicator of soil health and improved physical conditions. Increased biological activity occurs in the soil after the incorporation of organic matter from cover crops. PROVIDE A HABITAT FOR BENEFICIAL INSECTS: Since pest management strategies in organic winegrowing emphasize reliance on nature and the use of “soft” chemicals, it is important that beneficial arthropods are abundant and in close proximity to the vineyard to control harmful insects and mites. Cover crops can provide habitat and food for beneficial insects at different stages of their life cycle. They also provide habitat for prey, such as aphids, mites, caterpillars, and other creatures. 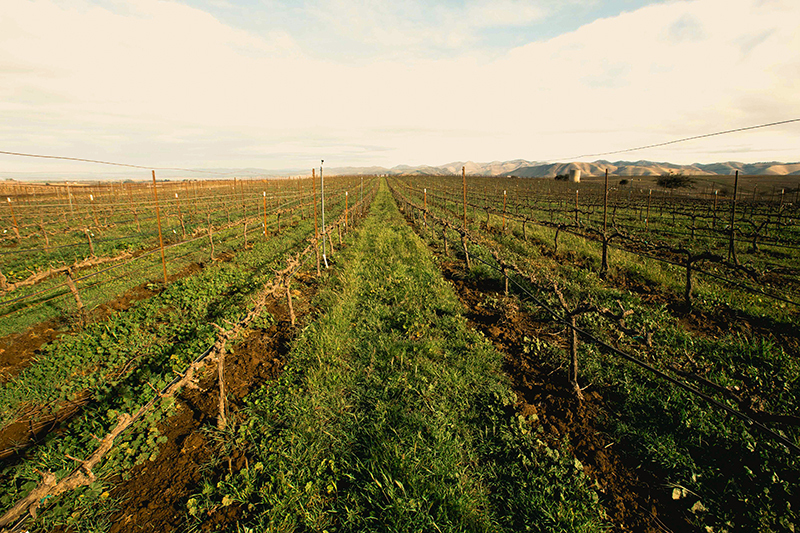 IMPROVE AIR & WATER QUALITY: Cover crops help to prevent erosion, keeping vineyard water runoff free of silt and excess nutrients. Nitrogen formed by legumes is less mobile than soluble nitrogen fertilizers. Cover crops assimilate free nutrients in the soil, and stabilize them during periods of high rainfall. During the dry periods of the year, cover crops help reduce dust, improving air quality. This also helps to reduce the problem of mite infestations, which intensify under dusty conditions.